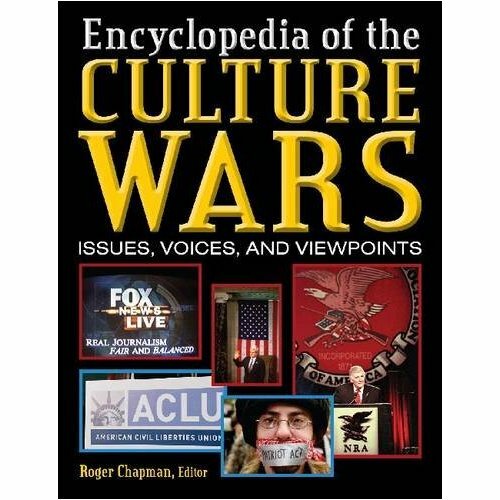 When I was in the UGA history masters program I wrote two articles (about Edward Said and September 11, respectively) for the Encyclopedia of the Culture Wars: Issues, Voices, and Viewpoints. Well, the voluminous encyclopedia just came out on October 30 and I got my free copy today. Wooo! And for the low, low price of $147, you can get yours too! 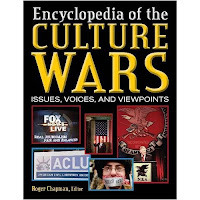 According to booklist: "This specialized encyclopedia groups a tremendously wide range of topics under the general rubric of “culture wars." Among the more than 600 entries will be found coverage of the American Civil Liberties Union; Barbie doll; Coulter, Ann; Fur; Gangs; Hispanic Americans; Moore, Michael; and Smoking in public. Each entry includes see also references and a bibliography. A "Topic Finder" helps readers find like articles under loose groupings such as “Activists and Advocates,” "Ideologies and Movements," and "Social and Moral Issues." The contributors, virtually all academics, display a rarely bland, sometimes quirky, and usually engaging style of writing. Entries do a good job of explaining why the topics they address are part of the culture wars, and many lay out opposing viewpoints as well as providing context and background. For example, Drug testing explains how the practice began and has grown and outlines the arguments and strategies on both sides. Longer entries, such as Globalization, Health care, and Right to die, offer useful historical summaries showing how various debates have evolved. Statistics, important court cases, and books and other documents are cited throughout the entries, bolstering their authority and objectivity. 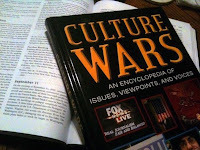 Culture Wars makes for interesting reading and is recommended for collections in academic and large public libraries. My contribution is just a small part of this huge work, but any byline is a good byline and I'm thrilled that I had the chance to write on two topics close to my academic interests. Now, on to the next writing project!